Just copy the .swift files from the SwiftyComments/Classes folder in your project. feed your models to the CommentsViewController. private let commentCellId = "commentCellId"
By default, when a comment is expanded, the tableView will scroll to make the replies visible. You can turn this feature off throught the property makeExpandedCellsVisible. Additionally, you can start with a fully-expanded tableView by setting the fullyExpanded property to true. You can easily add special styles (titles, links, paragraph spacing, bold/italic font for some words, ..) in your commentContentView using a UITextView with a NSAttributedString. Though, if your comment contents are in html format you may want to reconsider your eventual plan of using the DocumentReadingOptionKey.documentType: NSAttributedString.DocumentType.html option. Even if this way is really simple and straightforward, it’s not efficient and takes a long time (.15 – .2 s in my experience) to load the string. Since the height of the cells are automatically calculated based on their content, that delay leads to glitches/lagging. An alternative (illustrated in the HNCommentsViewController example) is to parse the html yourself and build the NSAttributedString by adding the attributes "manually". This may be more difficult to implement depending on how complex the format of your comments is, but it’s waaaay more efficient. The example makes use of SwiftScanner to parse the html of the hackernews comments. Check the HNCommentContentParser.swift file for more details on how the AttributedStrings are built. You can implement this protocol and correctly set the delegate attribute of CommentsViewController to be notified when a cell is expanded/folded. You can use this to, for example, minimize a comment when it has been folded. Check out the RedditCommentsViewController example for more details. SwipeCellKit is used to add a "Swipe to Hide" action on each comment cell. This functionality can be disabled using the swipeToHide property of the CommentsViewController. For more information, reefer to the documentation of SwipeCellKit. public func tableView(_ tableView: UITableView, editActionsForRowAt indexPath: IndexPath, for orientation: SwipeActionsOrientation) -> [SwipeAction]? SwipeCellKit was preferred over the default UITableViewRowAction introduced in iOS 8. 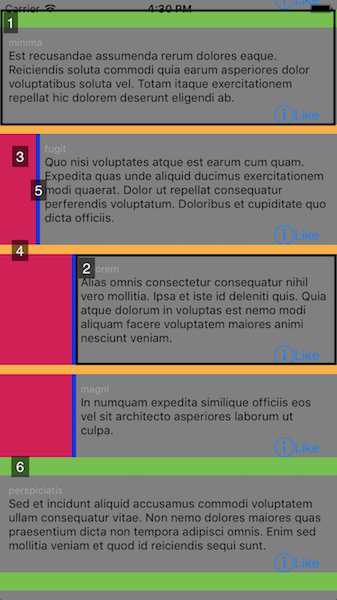 The main reason for this is that the UITableViewRowAction doesn’t handle well the resize animation of the cells: as the size of the cell is reduced (when it folds), the UITableViewRowAction keeps it initial size and overlaps the other cells. Another reason is the better customizability of SwipeCellKit. To run the example project, clone the repo, and run pod install from the Example directory. HNCommentsViewController illustrates the use of AttributedStrings. The animation for adding/deleting rows in iOS 11 is a bit weird.. any solution? mark comments as expanded/folded so that, when expanding a comment, the state (expanded/folded) of its replies is maintained. Currently, when a comment having folded replies is folded and then unfolded, its replies are being unfolded too. SwiftyComments is available under the MIT license. See the LICENSE file for more info.